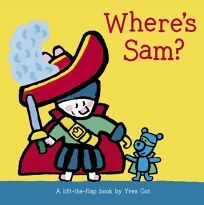 Yves Got's Sam series continues with the oversize paper-overboard lift-the-flap book Where's Sam? Here, Sam plays a dual game of dress-up and hide-and-seek. For ""Who is hiding behind the balloons?"" readers lift a colorful flap to discover ""It's Sam the clown!"" The bunny also masquerades as a pirate, crocodile and knight, among other characters.